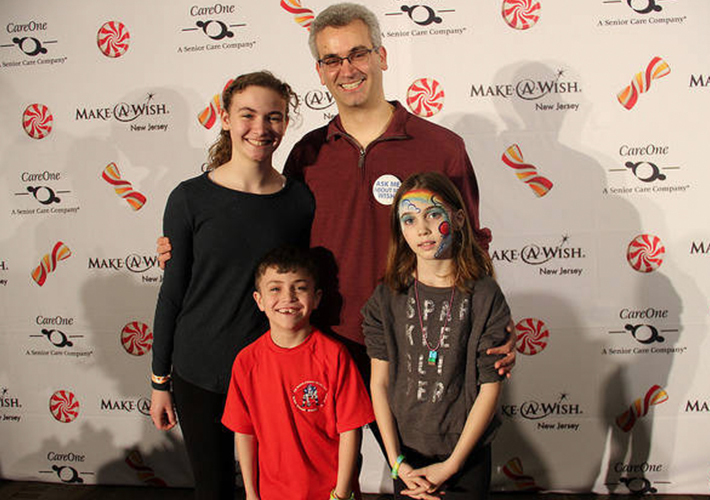 NEWARK, NJ – For the Courtright family, the 200 Wishes carnival on Sunday, February 26 at the Prudential Center in Newark was about spreading the message of Make-A-Wish New Jersey and all it is able to accomplish for so many families across the state. The Caldwell family certainly knows the value. Two of their four children – Matthew and Mitchell – have cystic fibrosis. For Matthew, age 12, that meant a wish was granted to surf in Hawaii. For little Mitchell, age 7, it meant he finally got to see his true hero, Pluto, during a trip to Disney World. “It is really hard to put in words what Make-A-Wish New Jersey has meant for our family,” said Gregory Courtright, who attended the Sunday event with Mitchell, as well as his two daughters, Makenzie, 15, and Miranda, 9. Another way the Courtrights showed their support was to tell their story to the gaggle of media who attended Sunday’s event, generously presented by CareOne, a family-owned healthcare company. It was a record-setting day, with $1.3 million generated for Make-A-Wish New Jersey – enough to generate 200 wishes. The impact of funding 200 wishes from a one-day event is tremendous, as the non-profit is typically able to raise enough money through the year to grant on average 500 wishes. Yesterday’s event included about 30 wish children and their families, who participated in a dizzying number of attractions, from jumping castles, to photos with Darth Vader, to building stuffed animals. Spearheaded by CEO Daniel E. Straus and Executive Vice President Elizabeth Straus, the family-oriented event included ice skating on the New Jersey Devils’ ice rink, carnival games and prizes, a Build-A-Bear Workshop experience, and special guest appearances by Olympic Medalist Nancy Kerrigan, Corey Schneider of the Devils and Miss New Jersey Brenna Weick. Another featured guest at the carnival was Kerrigan, who met with wish families and led two ice shows. “It is really great to be here,” she said, adding that Care One has done a terrific job create a family event that has been able to raise so much money for Make-A-Wish New Jersey. Care One is New Jersey’s largest privately-owned post-acute and long-term care provider, and one of the largest privately-owned health care companies in the United States. Each year, CareOne selects a charitable organization to support, with past initiatives raising more than $5 million in funds for organizations including: Superstorm Sandy relief efforts, Boston’s One Fund, The Valerie Fund Children’s Center for Cancer and Blood Disorders, and the Breast Cancer Research Foundation. “As health care providers, we are committed to improving the quality of life of our patients and their families,” said CareOne CEO Daniel E. Straus. “Partnering with Make-A-Wish New Jersey enables us to extend this commitment to children and families throughout New Jersey.” According to Make-A-Wish New Jersey, wishes impact everyone involved – wish kids, volunteers, donors, sponsors, medical professionals and communities. All proceeds raised at the 200 Wishes event are going directly to Make-A-Wish New Jersey to grant wishes for children with life-threatening medical conditions to enrich the human experience with hope, strength and joy.